The first car was developed in the 1880s, but was not an immediately popular mode of transportation. Early cars were very expensive and therefore only available to the very wealthy. In 1908 Ford Motor Co began mass producing cars making them affordable to the masses. By 1917 there was one car for every 22 people in the United States. Now that people had cars, the issue became where to store them. 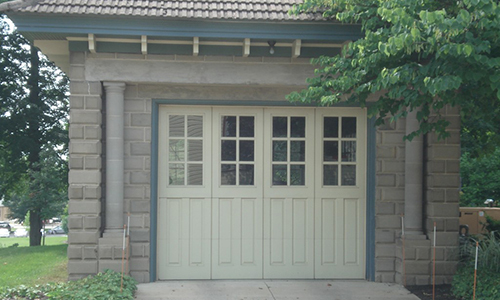 During the late 1800s and early 1900s car owners converted many carriage houses and outbuildings to garages. 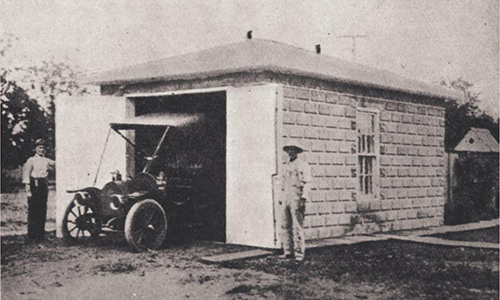 Then in the early 1900s several companies started producing mail order portable garages to the middle class. 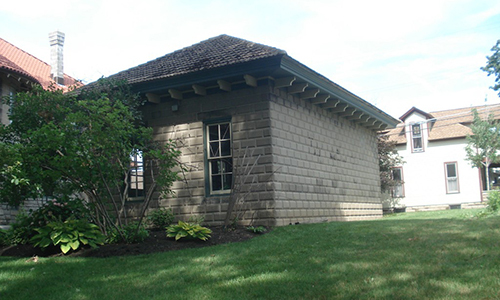 By the 1920s and 30s these evolved into the more permanent detached garages built of both wood and masonry. 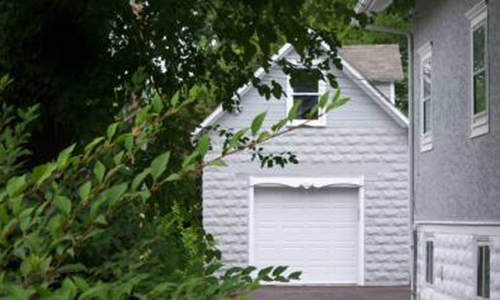 Many of these garages were constructed out of prefabricated kits or based on plans published in pattern books. During this time rock face block, or rusticated concrete block, was becoming a popular building material around the country. Not only was it aesthetically pleasing but it was a great insulator, and it was fireproof. Fireproofing was a serious concern when storing early model cars. These cars used flammable petroleum products and had headlamps that used the highly flammable acetylene gas. This lead a great many people to build their new garages with rock face concrete block. 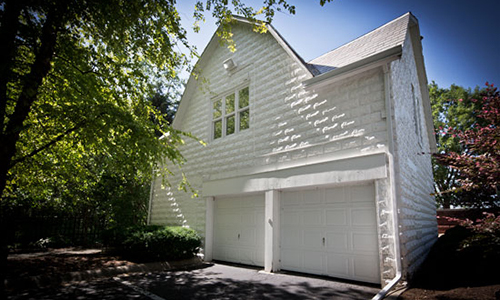 You will often see these garages placed towards the backs of properties. The garage was a purely utilitarian building and not for show. It was common for people of this era to spend their free time on their front porches, relaxing after work and visiting with neighbors. Keeping the sights, sounds, and smells of the garage away from their outdoor living space was important. Cars became the ruin of the front porch . With so many cars on the streets, they were now filled with the busy flow of noisy traffic. People retreated to back yards and back patios for a more quiet and private setting. People demolished the old garages since they were spending their leisure time in the back yard. They attached to or moved the new garages closer to the front of homes. During this time rock face block fell out of popularity as a design element. You will see very few of the newer garages constructed using this material. However, look around and you’ll still see these old concrete block garages here and there…a reminder of the beginning of a new era, the era of the automobile.